Aw, isn’t he cute? Looks are deceiving, because if you get him started, this duck says some vulgar things. [Gigavolt] found the little guy abandoned at the Goodwill store and decided it might have some hacking potential. Boy was he right. The stock toy can already sing a tune while flapping its beak and wings. After spending some time in [Gigavolt’s] lair, this duck is going to be on the naughty list. The best part is that this is going to end up in the hands of someone else thanks to a Secret Santa exchange. The build article linked above is safe for you to read at work, but the video embedded after the break most certainly is not. [Gigavolt] got to work replacing the integrated circuit inside with his own PIC 16F628 microcontroller. He uses a new audio track, which is played back by a SOMO-14D audio player board. The two use different input voltage levels which is something of a bother, but it’s a standby power drain that has been vexing [Gigavolt] he rolled his own board using the DorkbotPDX order and can’t figure out why the current consumption is so high. 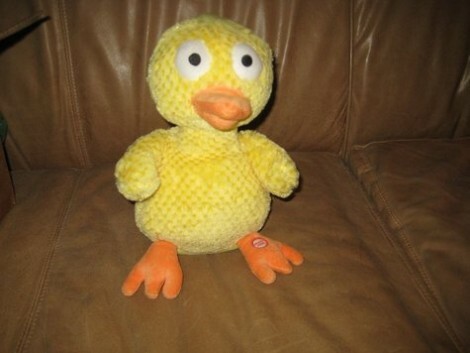 Take a look at the cursing duck, then see if you can’t troubleshoot his electrical issues. I’ll take two. Box them up. Been around a long time but I’m not sure where it’s from. I’ve always thought it aired on Bob & Tom on the radio. But i could be wrong. A classic audio clip. Looks like Gilbert Gottfried has a new career headed his way. As for your phantom current… I’m guessing it’s coming from the PIC, and going into the audio player through the CLK and DATA lines. You are driving those lines with 5.3V (6V battery – 0.7V diode drop), dropping the voltage through a diode (4.6V) but your audio player is running on 3.3V (a whole 1.3 volt difference). Your audio player likely has clamping diodes on it’s input, so your extra 1.3V is easily biasing them with a 3.3V supply on that chip. However, you have the 100 ohm resistors in there… so that should limit the current to (1.3V – 0.7V / 100) = 6mA. So if your idle state on the PIC I2C (?) bus is high, that’s only accounting for 13mA of current. You are also biasing your Motor outputs with 13mA of current on the base of those transistors… way overkill, although I have no idea what the transistors are, their gain, or the output current demand of the motors. Although, if they are on that’s another 26mA. Just on your consumption issue (hopefully I’m not missing something obvious), but why not power the pic from 3.3V (the spec sheet seems OK with it)? – that should sort that higher voltage appearing on the SOMO thing as well as any extra current flowing into it through the I/O. Also you could replace that linear regulator with an LDO to save power and those BJTs with FETs. Sometimes with PICs just making sure all your I/O is set right when going into sleep can make a huge difference. That is ducking amazing, and the animatronics mtached to the audio, awsome! It would be funnier without the laugh track. The VCC problem struck my interest. I fetched your eagle design-data and had a closer look. even if the schematic has a couple ERC messages, it seems ok. BUT there are no diodes between the PIC and the SOMO, what also causes a bunch of forward annotation errors. Now looking at your pics i cannot tell if you put these diodes in before ordering the pcb, or if you modified that or if they’re simply missing. Still, reading the datasheet, a 100R Resistor is actually enough for use in a 5V system. Here’s my guess: In your schematic, you’re using 100-470uF for C3 and C4. Probably electrolytic caps. Are they mounted the right way round? Remember: on Tantalum caps (unlike the normal electrolytic caps) it’s the positive side, that’s marked. I have to admit, this is damn funny. Definately not Howard The Duck. Duckjob ftw. Classic 1990s viral internet meme. Takes me way back. You are my HERO!!! I know what I’m doing next Secret Santa! I wanted to thank everyone for the comments. I needed 6volts to run the duck motors, but I never thought about using the 3.3 reg. to power both the PIC and SOMO-14d board. My power consumption problem is coming from the regulator itself. And it looks like I left out the diodes between the pic and somo on the board. I think I ran out of room. I should have used a voltage divider to drop the 5v to the 3.3 level. Thanks again! Your comments will help those that try to duplicate my project.